The readers of this blog have become accustomed to the “what the heck is he going to write next” feelings that come. GOP registration is at 25.6% in California and falling despite Republican gains in most other areas in the USA. It seems that our leaders here are quite happy about it. With few exceptions there are no voter registration drives going on in the state, I’ve even had one sitting member of the legislature tell me that they conscientiously chose not to do it because they did not think it would work! I’ve been clear for years that one of my primary issues are do-nothing Republicans that get in to office and do nothing. What I mean by doing nothing, is just fighting futile fights on the floor of the legislature, giving good speeches or making base-stirring social media posts. What I mean by doing nothing is not raising money, not recruiting candidates for local government, not engaging with local Republican groups to help them thrive – you know the team building that leaders do. Worse, like the above example are those that surrender rather than fight. I joined the GOP in 1997 the first time I ever Registered to vote. Jeff Atteberry, the former Chairman of the GOP who was ousted by $100k of California Swamp money and a group of tea partiers working with the establishment, predicated on a lie. You’ve read that ad-nauseum. You’ve read me naming names of alleged Republican operatives and their misdeeds for years. Jeff Atteberry’s ouster as Placer GOP Chairman is a microcosm of the culture I believe has invaded the CAGOP at all levels. It is called “Controlled Failure” by several of my fellow bloggers. I’ve learned that as of late, the local Tea Parties basically have figured out who their local Representatives are and what they are doing. Good for them. The Tea Party and the State of Jefferson Movement are fractured and as a result are largely ineffective to deal with the magnitude of control the Swamp has. It breaks my heart to see the State of Jefferson movement fractured as I see a bunch of good people that can’t seem to get along with each other. While I cringe over the elements that some Tea Parties attract and have mocked some of them over the years, at the end of the day most of these folks are well-meaning people that want a better America. They understand how they were being used as part of the controlled failure of the Doug LaMalfa / Jim Nielsen / David Reade machine in the North State. They were deceived by the swamp, we’ve all been there. I want a better America. I want a better California. I am still here. The rest of my family moved across the border to light-blue Nevada. Chad Mayes represents the worst of all worlds in politics. I’ve written about him ad-nauseum, but his fall from Assembly Leader to Assistant Republican Leader (that’s right folks, he lives on in leadership) is a laboratory for the incredible corruption that has infested government at all levels. It is the “art of the deal” on acid. It seems daily that I am finding out new stories of scum descending to the drain of the political sewer. You’d think the Republicans would keep their noses down. Instead, it appears there is a culture where a “Republican” gets elected to office and goes to Sacramento to participate in their own special version of Ashley Madison. Recently, another blog outed a second sitting legislator having an affair. Lovely. I’ve been told of two more, including a former legislator who is seeking to get back in to office. Lovely. I am waiting for a Republican in California to get caught with $80k in his refrigerator, they have to aim higher than just sleeping with another man’s wife, etc. I’ve basically seen it all, then I get reminded that I have not seen it all. Here locally in Placer County, the current chairman, Dennis Revell is a good man. I like the guy on a personal level, but he was elected to office because of the swamp and the money they spent trying to take control of the Placer GOP. I’ve been writing about that off and on for several years. I am torn between my personal convictions which are in line with the Conservatives, my rational side that is looking at the poor behavior of the tea party (and the insanity or personal corruption of some), my activist side which resents the money spent, the manipulation, the control and of course who I know Dennis to be as a man. Dennis is getting little help from the electeds that helped install him as Placer GOP Chairman. I think Dennis Revell got screwed over. Were the Conservatives to oust him (which they have to votes to do at any time pretty much), they have no one who will step up to replace him. Then I look statewide and see the same pattern everywhere in GOP Central Committees. In some counties, the Conservatives were exterminated (such as in Sacramento, which is controlled by political consultants who ran for Central Committee) and in others the manipulation and financial investment muddled the ranks to the point where most committees are dysfunctional, inept disasters. It appears then, that the Swamp is happy. Most Republican Volunteer Groups are a shambles. The aforementioned Tea Party is fractured with bad actors trying to control parts of it. Many Central Committees can’t make quorum. Most all are broke. LA County’s executive director was effectively laid off. The State Party has been besieged for years. When the remnants of the Republican Party rose up against the rudderless leadership, the game became about one man’s bombastic ego and desperate need to prove how right he was and how wrong the rest of us were. What could have been a teachable moment for the GOP was once again wasted. I’ve heard it called “Controlled Failure”. Controlled Failure is the base human nature of I don’t care what the results are as long as I am in charge, feeling relevant and feeding my personal vices. Controlled Failure is the top-down command and control structure that exists within the CAGOP as we know it. I have become aware that the Swamp were working behind the scenes to try and stop resolutions calling on the tyrant Chad Mayes to resign. It is clear that the Swamp were rallying intransigent members of the CAGOP’s Board of Directors with talking points in a vain attempt to stop the GOP board from calling on Mayes to resign. I’ve learned from conversations that they have been attempting to meddle in every leadership decision at every level of the California Republican Party. 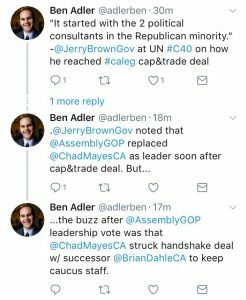 I am not 100% sure why the new Assembly GOP Leader Brian Dahle tapped Chad Mayes and four members of his crew to fill leadership slots. My best guess is that it appears that the Assembly GOP is so fractured and unclear in its’ thinking that Vince Fong, Jay Obernolte, the Tyrant or Mr. Dahle could not get to 13 votes themselves so a deal had to be made. I’ve attempted to reach out a few times to Dahle’s camp for comment and have not heard back yet. It appears that new Assembly GOP leader Brian Dahle has appointed several folks from Chad Mayes leadership team to his own team. (Including the tyrant himself) I have reached out to Dahle’s staff for comment. As of the date of this blog, I’ve yet to connect. The CAGOP convention is coming up in October. IT looks like there is going to be a lot going on. Apparently 25.6% GOP registration seems to be too high in California. UPDATES: Feedback post posting indicate that Kristen Olsen is disputing the account of her actions related to her own Church. And, Seren Taylor was employed by the State Senate and did not move to the Assembly until after Olsen was out as leader (and Chad was in). Sources indicate that Olsen was involved in Taylor’s move to the Assembly side however. This morning an anon source made me aware of a series of tweets from a political insider, well known in political circles. Ben Adler is the bureau chief of Capital Public Radio and has some credibility. Adler noted that Jerry Brown gave props to 2 political consultants in the Republican minority. We’ve written about Seren Taylor, who is an extreme left-wing Republican from New York that was brought in by Kristen Olsen when she went on a Stalinistic rampage against the Assembly Caucus Staff. I was of the opinion then that it mattered more to Ms. Olsen to put her own people in than anything as her ego dictated that she was in charge and it was time to leave her own mark on the building. In the years since, seeing the insanity coming out of the caucus staff with a consistent flow of recommendations to adopt democrat positions on the issues of the day confirms the ideological element. 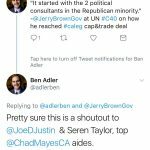 While no one will know short of asking Jerry Brown himself who he was referring to, the suggestion that Joe Justin and Seren Taylor were the objects of Governor Brown’s affection at the UN climate change jihad meeting is as valid as any. It is also very reasonable to assume that Adler’s assumptions were based on off the record conversations with insiders familiar with the sausage factory. Given Adler’s history of being fairly accurate with his facts, I am inclined to agree with his assessments. Mr. Justin who I regard highly as a campaign consultant is far more liberal than most Republicans I have ever met and he does drive a Tesla, by the way. Justin is indeed very green in his personal ideology and as Chad Mayes Chief of Staff would have been intimately involved in Cap and Trade. Seren Taylor, who I recently introduced the readers of this blog to, is also very far left on the Republican Spectrum and would fit in well with Susan Collins, but not the other 90% of the GOP. His job is reading polls and giving advice based on them. One of the things I was told by several folks on the inside is about polling data showing that environmental issues were a must for the GOP to compromise on. The legacy of cap and trade is owned by Kristen Olsen as much as it is Chad Mayes via the staff that Olsen hired (Seren Taylor and others) that her ex-boyfriend retained. 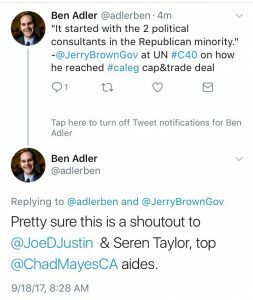 Back to the tweets – Mr. Adler was not done with outing Seren Taylor and Joe Justin as the Cap and Trade Masterminds. He had a bit more to add. The last tweet is also credible as I have been familiar with the rumor that Chad Mayes, ever the narcissist, was seeking to control everything he could. Remember, on his way out the door, Mayes blew up the CA GOP fundraising apparatus (or attempted to), called donors to dissuade them from participating, retaliated against Melissa Melendez, Jim Patterson and a couple others, took all the best committee assignments for himself, held fundraisers to do a last-minute cash in on his leadership and of course several of his staff were walking around beating their chest as if they were still in charge. Even in the final week of the legislative session, Mayes was in the middle of some of the worst bills trying to “cut deals” to deliver Republican votes for some complete garbage that passed. Then, there is this tweet. Once piece of contrary information – Mike Zimmerman, the strategic director for the Assembly GOP Caucus was ousted. He was replaced by now former Tom Lackey Chief of Staff George Andrews. Lackey was a solid opponent of Mayes. It appears that Brian Dahle’s (The Leader that replaced Mayes) first move has been to reward an opponent of Chad Mayes. I am going to reserve judgement as my knowledge of Dahle and his Chief of Staff Josh Cook suggest to me that there will be changes, but it did not stop the malignant narcissist Chad Mayes from trying. Speaking of Kristen Olsen, I’ve spoken to a few people with knowledge of her divorce situation. She has been demonstrating the same sort of arrogance and hubris as her now former boyfriend Chad Mayes. Once the affair became known, her Church confronted her on it, not only did she refuse to accept responsibility or apologize, she showed up to that church multiple times to show everyone who was boss. It makes sense, then that she’d be at the next CAGOP board meeting, (Chad’s last as leader where he informed the board they would never raise any money again) acting like she was in charge. It also makes sense that she would be out making public appearances. It is as if the preponderance of evidence, including several photos of her with Chad Mayes even while she denied the affair was happening are fake in her mind. Her lack of conscience and complete inabililty to see her own shortcomings should scare us all as much as the same behavior in Chad Mayes did scare many. Those that helped get Kristen in to the CAGOP Vice Chair slot apparently want her to ride out this storm and run for CA GOP Chair in 2019. Remember, beyond her arrogance, hubris and lack of integrity are the staff within the Assembly GOP Caucus that aborted the GOP Platform multiple times, culminating with Cap and Trade. We will all be told, there is no one else in the North State that can do the job, so we have to elect Kristen… wait for it, it is coming. Even if Kristen did not have institutional support, anyone that thinks Kristen Olsen will go away on the natural is a fool. Anyone that tries to find an easier softer way should look no further than Chad Mayes’ Narcissistic Rage on his way out the door as a blueprint for how Kristen will deal with anyone and everyone she thinks is disloyal. The only solution is to make sure she is run out of any position of leadership with extreme prejudice. AD72 Update: Did Tyler Diep attempt to Obstruct Justice and Abuse his Power? 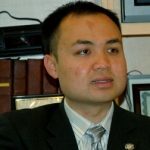 After Tyler Diep was elected to the city council in 2009 one of the first things he did was try to use his power as councilman to intimidate the local police. The Story was chronicled in the Orange County Register. Tyler Diep tried to bar police from doing routine business checkups on a local restaurant/bar owned by his friend. The restaurant/bar is a frequented by Diep and his buddy Andy Quach, a former councilman and many other Diep friends. Quach was arrested for DUI just a few months earlier and it was rumored he was leaving this same bar. In my 20 years in politics, I have observed a much larger number of people within politics who drink to excess (than in the real world) and this incident makes me wonder if this describes young Tyler as well. Months after Quach’s DUI, Diep went ballistic and called the watch commander when he heard that police were doing a routine check-up at his favorite hangout. When Diep was told his call was being recorded, as all calls to the police are, Diep drove down to the Police Station after midnight to talk to the Watch Commander directly to try and convince them not to do their job. Had Diep been drinking? Was Diep worried he would get a DUI of his very own? Would this jeopardize the massive haul of taxpayer dollars he currently enjoys? The police officers repeatedly tell Diep their check-up was routine but that doesn’t stop him. “I’ll talk to the Chief about it” he ends up warning the officers. Rice is spot on. Tyler Diep’s behavior should scare us all. What would he do in Sacramento? P.S. Could you imagine the negative campaign mail this story alone could bring? Diep has been lining up endorsements in an attempt to look inevitable. Having seen a string of “inevitable” Republican candidates lose in recent years, it is time to think AD72 through before there is mass buyer’s remorse.